Also known as Adventures with Adolescents…or is that Adolescence? 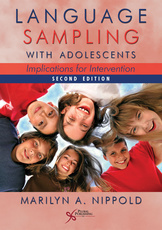 The book starts with a brief introduction by Dr. Nippold into the “why” of language sampling for older children. It includes a “Note To Instructors” that breaks down the suggested format for using the text as a text for university classes in language assessment and intervention. Following her suggested layout, the student would read Chapters 1 & 10, 2 & 11, 3 & 12, and 4 & 13, 14 during the first half of the semester. The second half of the semester would cover chapters 5 – 9 in preparation for the students to actually complete (elicit, transcribe, analyze) language samples and plan interventions (which are covered in chapters 7-9). Chapter 3: Adolescent Language Development. This chapter includes a nice table of the syntactic development of adolescents. It gives examples of various language elements (appositives, passive voice, idioms, jokes, etc.). Chapter 4: Language Sampling Guidelines. This section discusses some of the difficulties associated with getting a language sample from an adolescent. There are several things to consider: motivation, knowledge, stimulation, and which type of discourse is warranted. This chapter also includes general suggestions for interacting with the adolescent and transcribing the sample. Chapter 5: Language Sampling Tasks. This chapter provides several language samples from children, adolescents, and adults of various language abilities. The breakdown and examples are nice to read (although hard to understand at times due to lots of SALT abbreviations). I like that this chapter includes both spoken and written sample examples. Chapter 6: Adolescents with Autism Spectrum Disorders. Nippold briefly discusses how adolescents with ASD will often improve language scores on standardized testing, but still have syntactic difficulties in conversation. This highlights why we need to continue to do language samples even in adolescents. This chapter provides some insight into the unique challenges associated with getting a language sample from adolescents with ASD. (In truth, I’d say with ALL adolescents because they can all be a bit challenging at times and require patience, flexibility, and a positive attitude…but the book specifies ASD.) What’s also nice is that this chapter includes some suggestions for areas to target and goals (note: they would need to be tweaked considerably to be considered a measurable goal. It is nice to have the suggestions as a starting point, but I would NOT use them for actual goals…at least not in the school setting). Chapter 7. Intervention: Conversational and Narrative Discourse. Exactly what it says…a chapter that offers suggestions for how to build language skills in conversation and narratives. This chapter talks about some of the struggles and offers suggestions for how to work on those. It was a fairly interesting read although I’m not positive how doable the suggestions are in the school setting (but in all fairness I’m not sure they’re not either…I haven’t tried yet). Chapter 8. 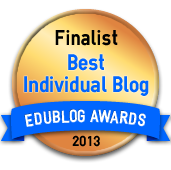 Intervention: Expository and Persuasive Discourse. The focus is of course on expository writing and persuasion. Chapter 9. Bringing it all together: The School Newspaper. This chapter discusses using the high school journalism class as the language intervention strategy and how it is necessary to collaborate with the journalism instructor. Part II: Grammar Review and Exercises. Each of the chapters in this section breaks down various grammar elements and provides exercises to help reinforce that learning. For instance, Chapter 10 works on types of words and phrases and discusses Nouns, Pronouns, Adjectives, Verbs, etc. It goes into detail with each one; with pronouns the chapter discusses the various types of pronouns – personal, possessive, demonstrative, reflexive, relative, indefinite, and interrogative (I wish I had this chapter when my daughter was working on these last year!). In the Verbs section, it’s broken down by main, copula, auxiliary, modal, finite, and nonfinite. I can see this being very helpful for many people (including SLPs like me who get confused by what teachers are calling what these days). I love the exercises that are included! There’s even an answer guide (thank goodness). Take Away…All in all, I think the text can be a good supplement. It’s not a hard read (even if all the SALT abbreviations get confusing at times). The last half of the book makes up for the slowness in the first half. (Disclaimer: I did not go through to make sure Nippold’s explanations of various grammar rules/names was accurate. I’m going to assume they are as she is the expert and I still have difficulty remembering which phrases are what without looking). I can see this book being a great supplement to an adolescent language course and for those of us that may not work with adolescents often, a great reminder for some potential difficulties that we may be called on to remediate. I plan on using this to help my daughter with some of her language difficulties and can see it being beneficial for others as well. « RRRRRacing toward good speech?